A Walk-in-Interview will be held on 16/06/2017 at 9.30 A.M in the Department of Cultural Studies of Tezpur University. This interview is for Tezpur University jobs for Field Monitor. This selection of 02 (two) Field Monitor is on a temporary basis for the UNICEF sponsored project. “Using Folklore for Community Messaging: Adolescents as Agents for Social Change and Empowerment- Phase III” under the Principal Investigator Dr. Jayanta Vishnu Das. The project entails extensive field visit and rural stay while working in remote places of Assam. Candidate shall not be more than 28 years of age on the date of interview. Upper age limit may be relaxed as per Government of India rules. Candidate must possess MA or PG Diploma in any discipline of Humanities and Social Sciences from recognized University/Institute with 55% mark with relaxation as per Govt. of India rule. Desirable Qualification: Candidate should have Computer Knowledge and experience in field research. 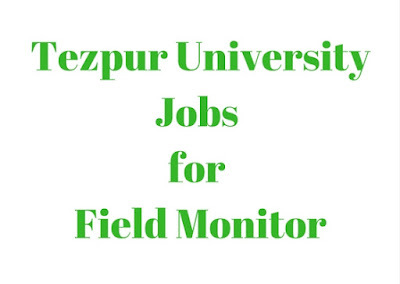 Selected Field Monitor will get a pay of ₹ 20,000/- (Rupees twenty thousand) per month. A copy of recent Curriculum Vitae (CV) on the day of interview. Candidates should send their bio-data to the Principal Investigator through email: jvdas(@)tezu.ernet.in on or before 14th June 2017. This job will continue till December 31, 2017 or till the completion of the project or until further order, whichever is earlier.